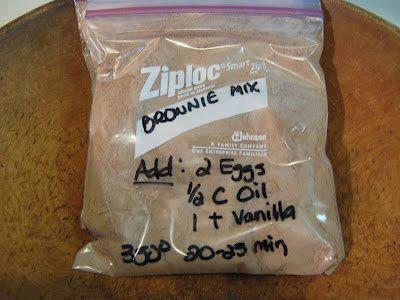 Follow the recipe below and make brownies for approximately .30 a mix! Bake @ 350 degrees for 20-25 minutes in an 8x8 or 9x9 pan. Depending on your oven, check after 12-15 minutes of baking and remove when brownies are done! Put mix in plastic bags or mason jars.